Google on Thursday unveiled its Nexus 5 smartphone, the newest of own branded devices in the space and a champion for the latest version of its Android operating system. The hotly anticipated addition to Google's Nexus line is powered by a new "KitKat" version of Android, which was redesigned to work across the wide range of handsets built with the Internet titan's free software inside. "Now you have one version of the Android operating system that can ship across all versions of smartphones in 2014," Sundar Pichai, head of the Android and Chrome teams, said while providing a look at the new software and Nexus 5. "As we get on our way to reach the next billion people, we want to do it with the latest version of Android." The move sets out to address the problem that the wide variety of Android systems being used around the world make it challenging for makers of fun, functional or hip smarpthone or tablet apps to design programs that work on all devices. Being stuck with old versions of Android also means that users don't get access to upgrades or improvements cranked out by Google. Apple executives routinely boast about how most users of its iPhones, iPads and iPod touches are on the latest version of the iOS operating system while many Android users are stuck with old versions. Changes in KitKat included fine tuning it to work with the limited memory capacities of Android smartphones priced for markets in developing countries or other places where buyers are on tight budgets. "It is important to us to get the same version of Android to scale across all versions of devices," Pichai said. Google partnered with South Korean consumer electronics giant LG to make the Nexus 5 smartphone to showcase the prowess of KitKat. 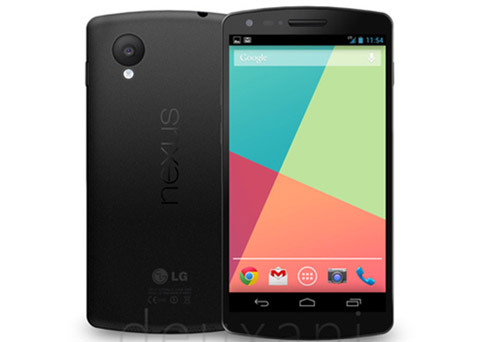 The Nexus 5 was available for purchase in 10 countries through Google's online Play shop, priced at $349 for a 16-gigabyte model and $399 for a version with 32 gigabytes of memory. KitKat was released to handset makers to begin building their own smartphones using the software, according to Pichai. "It is a cutting-edge operating system meant to run on cutting-edge phones, but it can run on older phones as well," Pichai said.